Thomas was born in Birmingham in 1882, the son of William and Sarah Hannah Wiltshire. They were living in Aston, Warwickshire, in 1901. In 1902, he married Louisa Smith in Aston. By 1911, they were living at 29 Wolverhampton Road, Wednesfield, together with their daughter, Winifred. Thomas had become a fitter of railway axle boxes. Thomas enlisted in the 1st/6th Battalion of the South Staffordshire Regiment (number 2415, later 240337). He was killed in action on 1 July 1916. He is remembered on both the Thiepval and the Wednesfield memorials. This is the fifth report from our volunteer, Frank Lockley, on the soldiers buried at Heath Town Cemetery. Buried 15th June 1918 age 31. Grave ref. old ground 25/13. 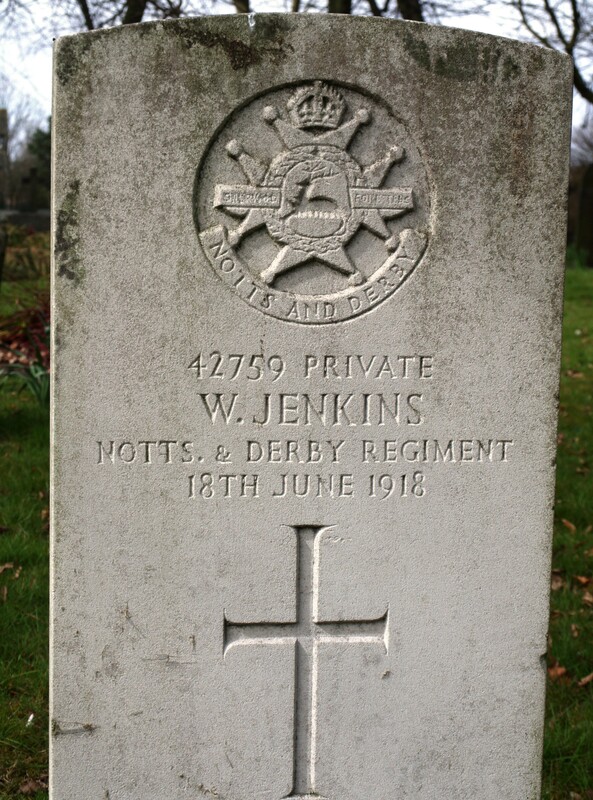 Wesley Jenkins was born in 1887, the son of Edward and Mary Ann. At the time of the 1911 census Wesley is an Auctioneers Assistant, living in Bath Road, Wolverhampton with his parents and elder brother Frederick. Wesley enlisted with the Sherwood Foresters (Notts and Derbys) regiment in Lichfield on 10th February 1916. He was posted to the 11th (Service) Battalion. The battalion was posted to Italy in November 1917. It was while on leave from Italy that he fell ill at home. After arriving home on 7th June 1918 he was admitted to the General Hospital in Wolverhampton on 10th June and died just two days later from pneumonia.